Isabelle Arsenault is an award-winning illustrator whose first children’s book received the prestigious Governor General’s Award for children’s literature in French (illustration). She lives in Montreal. www.isabellearsenault.com. "With evocative, gorgeous illustrations and an inspirational story of an artist not often covered in children’s literature, this arresting volume is an excellent addition to nonfiction picture book collections, particularly those lacking titles about women artists." "An inventive introduction to the work of a celebrated artist and a useful mentor text for exploring how language and imaginative, varied illustrations can work together to convey an idea." "The evocative, hand-lettered text, peppered with quotations in red ink, provides an impressionistic portrait of the memories, colors, sounds, and images propelling Louise's art. These motifs connect the imaginative ink, pencil, pastel, and watercolor illustrations, done in a palette of indigo, red, and gray. 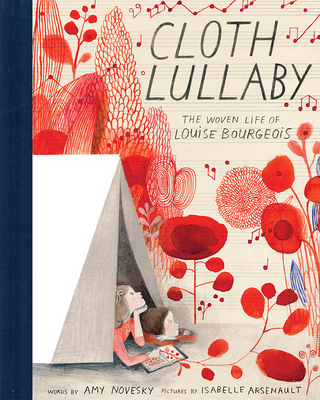 Bold, repetitive patterns of stylized flowers, woven crosshatches, spirals, giant spiders, and musical notes form the perfect background for the cloth lullaby Louise weaves for herself. Splendid visual and verbal introduction to little-known artist Louise Bourgeois."